This was Wan’s first Listener, although he has had an EV and a few Magpie outings. 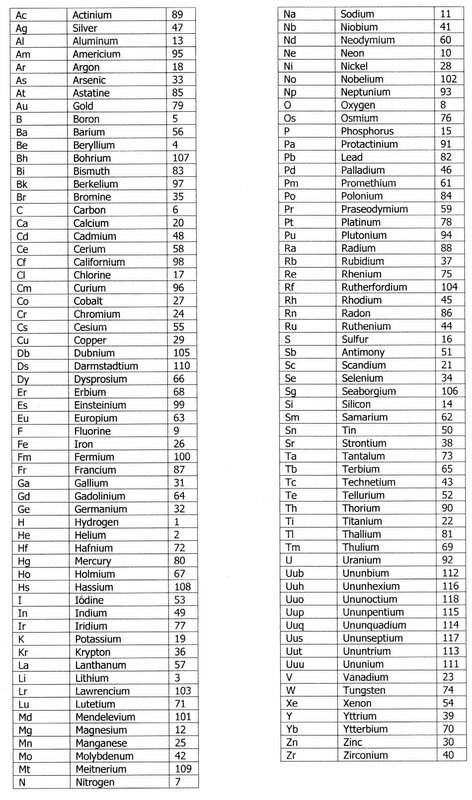 Here we had an old favourite, the periodic table, but with a neat twist: every clue had to have the two-letter symbol of one element replaced by that of another before it could be solved. 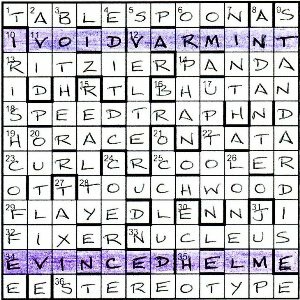 I gazed blankly at the first half-dozen or so across clues with nothing jumping out at me. Even 14ac Prince ate a protected animal … (5) passed me by until about half an hour later; it was, of course, PANDA (ate became and). 19ac Feet ache or hurt (6) looked like CHOREA or CHOREE, but again HORACE would take some time to make himself known (feet was poet). My first success was 23, where Tail Coil left on scoundrel (4) gave CURL. And so I was off. It was great fun teasing out the substitutions that were required. Sometimes they were in the definition, as in 23, sometimes in the wordplay like 7 Last of the Muses could be contributing to passion in snatches (5) with its ‘simple’, ‘hidden’ NINTH! It took me ages to suss astray for betray! I made a complete list of which symbol moved from which clue and where it went. The clue that evaded me until the very end was 28ac. Well, obviously it was TOUCHWOOD, but I just couldn’t resolve the clue: Perform art with supposedly supernatural power from tinder. I could see that the supposedly supernatural power was OD. After all, Chambers gives that as ‘Reichenbach’s arbitrary name for a force he supposed to manifest itself in light, magnetism, chemical action, hypnotism, etc’. OK, so ‘supernatural’ may not apply (although hypnotism has always struck me as a bit weird), but ‘supposedly and ‘power’ fitted perfectly. TOUCH can be to play a musical instrument, but the WO eluded me. Of course, it was a ‘simple’ double definition, with art becoming act, and needed me to pronounce it as touch’wood in one sense and touch’ wood’, with a pause, in the other. And so the letters of Dmitri Ivanovich Mendeleev could be found in rows 2 and 11, and a thoroughly enjoyable puzzle came to an end. I don’t know how detailed the Listener web site will be for the solution to this puzzle, so here’s a full list of substitutions if you need it. This entry was posted on 5 April 2013 at 3:55 pm	and is filed under Solving Blogs. You can follow any responses to this entry through the RSS 2.0 feed. You can leave a response, or trackback from your own site. Thanks for your very kind blog. It has been a nervy time waiting to see if solvers enjoyed it so I am very pleased to hear that you did. There are things that I could have done better of that I am sure but I have much to learn.